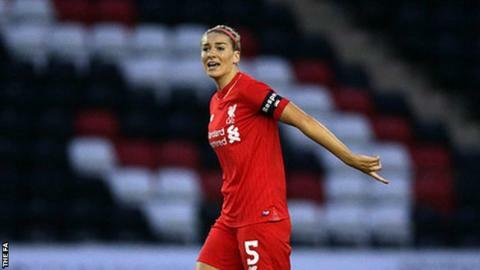 Liverpool Ladies captain Gemma Bonner will miss the remainder of the season with a serious ankle injury. The 24-year-old central defender damaged the ligaments in her left ankle during Wednesday's 1-0 away defeat by Brescia in the Champions League. A scan has now revealed Bonner will be out of action for eight to 12 weeks. The Women's Super League ended last week but she will miss the Continental Cup semi-final on Sunday and Wednesday's return leg against Brescia. Liverpool have sustained a large number of long term injuries to key players this season, including England midfielder Fara Williams and Nigerian forward Asisat Oshoala. Manager Matt Beard admits Bonner's absence is a further set back. "To lose Gemma at such an important part of the season is a big blow and again highlights how unlucky we have been with injuries this season," he said. "Losing Gemma means we now have eight senior players who are unavailable through injury, which makes our next two games even tougher."